My photo's are not brilliant as I tried to take them around the people standing admiring them! This is the Designer Collection, celebrating the 5th anniversary of the iCandy Peach. The Classic Edition (1st Picture) and The Black Edition (2nd picture). The Classic Edition is so different to all other iCandy pushchairs, with its duck egg blue chassis and brown leatherette handle and bumper bar covers it is beautiful and has an almost vintage feel thanks to the colours. The Black edition is the complete opposite, mostly black in colour with bursts of orange giving it an almost sporty, edgy look. What I found interesting was when asking a lady on the stand about the collection and how it had been received she said that she had noticed that the majority of Women seemed to be drawn in by the Classic edition and Men were drawn to the Black edition. I can't quite decide which is my favourite. I love the Classic but Orange is my favourite colour so love the wheels on the Black! The Stokke Home is the latest nursery concept from the genius designers at Stokke. I have always liked the look of their Sleepi but this is just that bit better in my opinion. If Elsie had her own bedroom, this would be in it! Another range that grows with your baby, It consists of Stokke Home Cradle, Stokke Home Bed, Stokke Home Changer and Stokke Home Dresser. The parts are bought separately so you can buy what you need and piece together your perfect Nursery. It is just so beautiful and magical looking. Any baby would be lucky to have the Stokke Home in their bedroom. The most eagerly awaited pushchair of the year and already receiving rave reviews from Baby websites and magazines, the Babystyle Egg is just amazing. I am struggling to put into words just how impressed I am with this pram. The shape is so unique and looks so spacious. The colours are simple but stylish and the accessories are just as quirky as the pushchair itself with their unique shapes. I especially love the Parasol with added UV protection. There will also be some Special Edition colours coming around July this year! There were so many pushchairs there this year, I loved being able to browse the stands and talk about pushchairs all day! oh that Stokke Home looks fab i love the tent bit on the top! 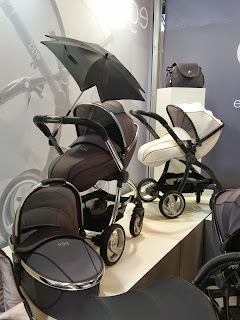 I am very interested and love the look of the Egg Stroller and you cant go wrong with a iCandy although i prefer the full black version out of those 2.